DIE Saturni, 2 die Octobris. Irish Prisoners to be disposed of. and with L. Forbes's Petition. Ordinances to clear the following Persons of their Delinquency. Votes about a further Application to the King. Message from the H. C. with Two Ordinances, and about Fox's. Votes concerning a further Application to the King. Ordinance to clear Brett of his Delinquency. Goreing, Levett, Gunter and Kibe, D°. George and Richard Graves, D°. Report from the Admiralty Committee, concerning the Disposal of the Irish Prisoners lately taken at Sea. Order for Bright to be Master Shipwright at Chatham. L. Viscount Say & Seale. Upon reading the Report concerning the Irish Prisoners: (Here enter it.) It is Ordered, To be referred to the Committee for the Admiralty, to take the best Way to dispose of them as may be best for the Ease and Charge of the State; and the Concurrence of the House of Commons to be desired herein. 1. To deliver to them the Votes concerning the Commanders of the Winter's Guard, to which this House agrees, with the Alterations; to which their Concurrence is desired. 2. To deliver to them the Ordinance for making Mr. Simonds a Fellow of Eaton Colledge, and to desire their Concurrence therein. 3. 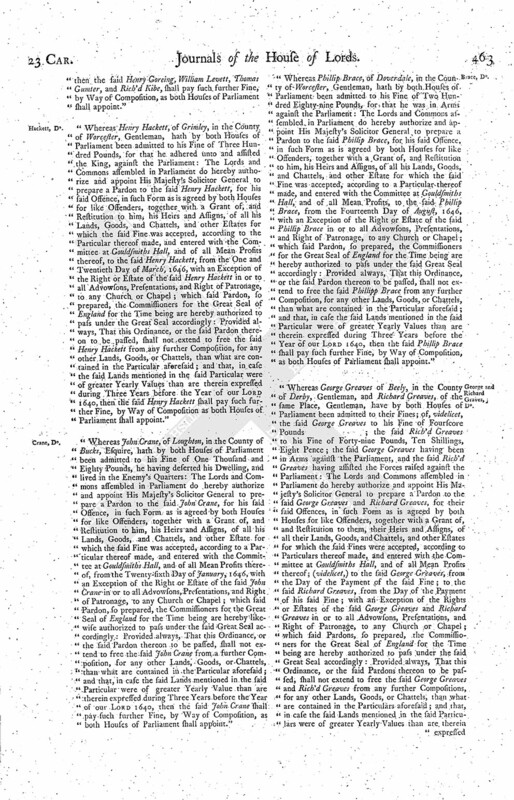 To deliver to them the Petition of the Lord Forbes; and desire their Concurrence, that any Three of the Committee of Lords and Commons for Irish Affairs be a sufficient Committee, to examine and report what they find concerning the Lord Forbes' Petition; and that Mr. Hawkins do attend the same. 1. 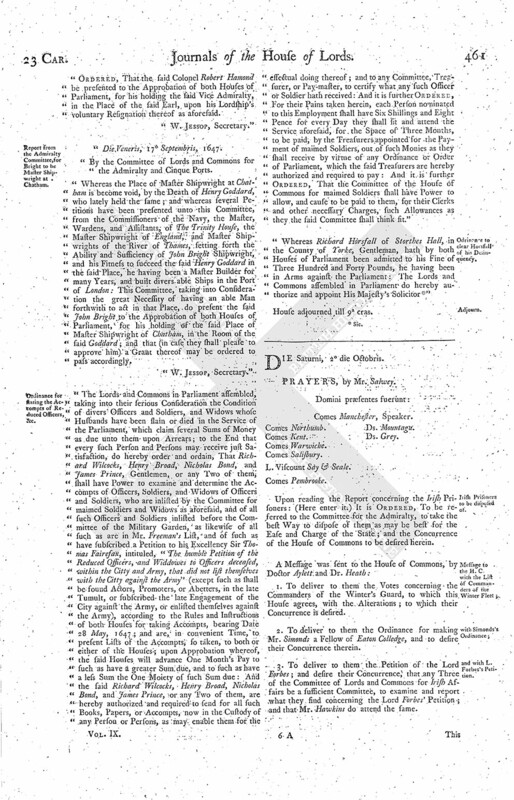 The Ordinance of Henry Brett. 2. 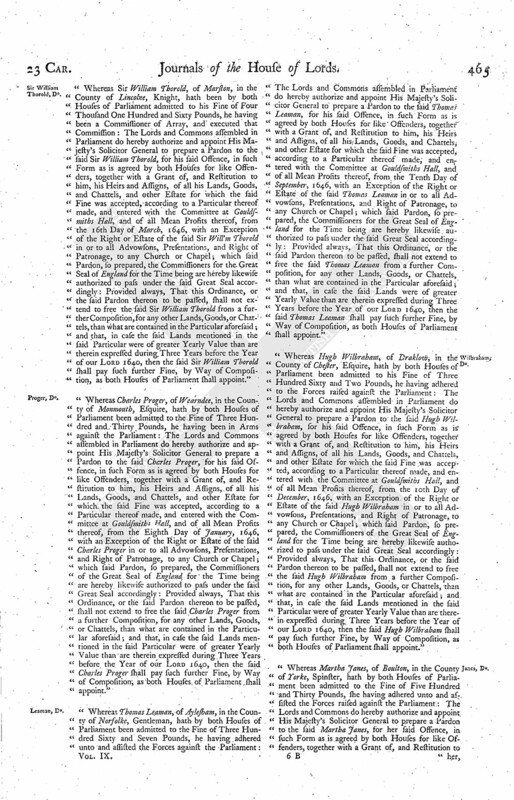 The Ordinance of Henry Goringe, Wm.Levett, &c.
3. The Ordinance of Henry Hackett. 4. The Ordinance of John Crane. 5. The Ordinance of Phillip Brace. 6. The Ordinance of George and Ric. Greaves. 7. The Ordinance of Thomas Bromley. 8. The Ordinance of John Evett. 9. The Ordinance of Ric'd Elmehurst. 10. The Ordinance of George Parker. 11. The Ordinance of Sir Wm. Thorald. 12. The Ordinance of Charles Proger. 13. The Ordinance of Thomas Leaman. 14. 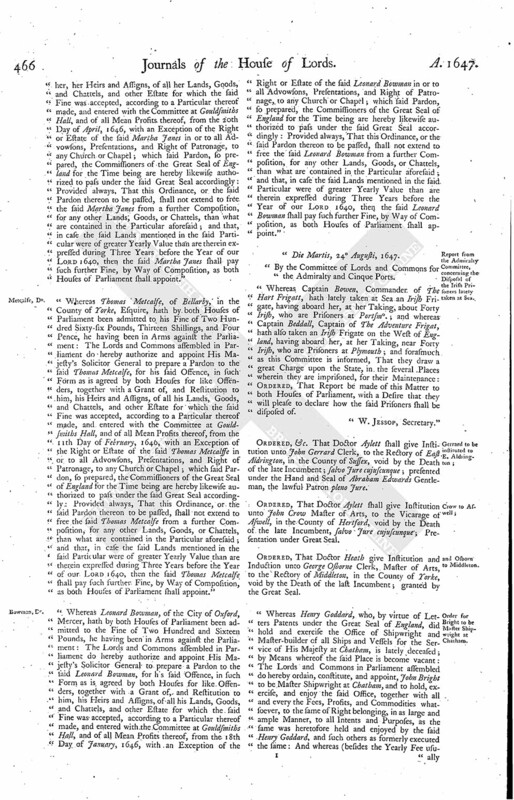 The Ordinance of Hugh Wilbrabam. 15. The Ordinance of Martha Janes. 16. 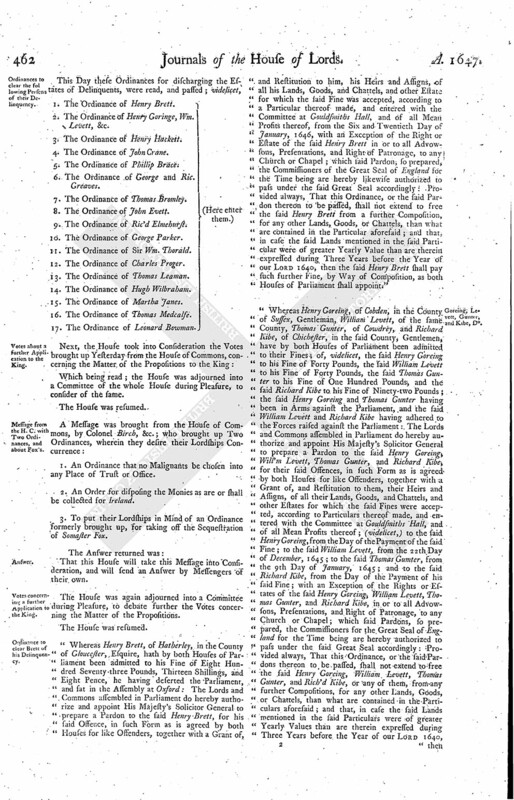 The Ordinance of Thomas Medcalfe. Which being read; the House was adjourned into a Committee of the whole House during Pleasure, to consider of the same. 1. An Ordinance that no Malignants be chosen into any Place of Trust or Office. 2. An Order for disposing the Monies as are or shall be collected for Ireland. 3. To put their Lordships in Mind of an Ordinance formerly brought up, for taking off the Sequestration of Somaster Fox. That this House will take this Message into Consideration, and will send an Answer by Messengers of their own. The House was again adjourned into a Committee during Pleasure, to debate further the Votes concerning the Matter of the Propositions. Whereas Henry Brett, of Hatherley, in the County of Gloucester, Esquire, hath by both Houses of Parliament been admitted to his Fine of Eight Hundred Seventy three Pounds, Thirteen Shillings, and Eight Pence, he having deserted the Parliament, and sat in the Assembly at Oxford: The Lords and Commons assembled in Parliament do hereby authorize and appoint His Majesty's Solicitor General to prepare a Pardon to the said Henry Brett, for his said Offence, in such Form as is agreed by both Houses for like Offenders, together with a Grant of, and Restitution to him, his Heirs and Assigns, of all his Lands, Goods, and Chattels, and other Estate for which the said Fine was accepted, according to a Particular thereof made, and entered with the Committee at Gouldsmiths Hall, and of all Mean Profits thereof, from the Six and Twentieth Day of January, 1646, with an Exception of the Right or Estate of the said Henry Brett in or to all Advowsons, Presentations, and Right of Patronage, to any Church or Chapel; which said Pardon; so prepared, the Commissioners of the Great Seal of England for the Time being are hereby likewise authorized to pass under the said Great Seal accordingly: Provided always, That this Ordinance, or the said Pardon thereon to be passed, shall not extend to free the said Henry Brett from a further Composition, for any other Lands, Goods, or Chattels, than what are contained in the Particular aforesaid; and that, in case the said Lands mentioned in the said Particular were of greater Yearly Value than are therein expressed during Three Years before the Year of our Lord 1640, then the said Henry Brett shall pay such further Fine, by Way of Composition, as both Houses of Parliament shall appoint." "Whereas Henry Goreing, of Cobden, in the County of Sussex, Gentleman, William Levett, of the same County, Thomas Gunter, of Cowdrey, and Richard Kibe, of Chichester, in the said County, Gentlemen, have by both Houses of Parliament been admitted to their Fines; of, videlicet, the said Henry Goreing to his Fine of Forty Pounds, the said William Levett to his Fine of Forty Pounds, the said Thomas Gunter to his Fine of One Hundred Pounds, and the said Richard Kibe to his Fine of Ninety-two Pounds; the said Henry Goreing and Thomas Gunter having been in Arms against the Parliament, and the said William Levett and Richard Kibe having adhered to the Forces raised against the Parliament: The Lords and Commons assembled in Parliament do hereby authorize and appoint His Majesty's Solicitor General to prepare a Pardon to the said Henry Goreing, Will'm Levett, Thomas Gunter, and Richard Kibe, for their said Offences, in such Form as is agreed by both Houses for like Offenders, together with a Grant of, and Restitution to them, their Heirs and Assigns, of all their Lands, Goods, and Chattels, and other Estates for which the said Fines were accepted, according to Particulars thereof made, and entered with the Committee at Gouldsmiths Hall, and of all Mean Profits thereof; (videlicet,) to the said Henry Goreing, from the Day of the Payment of the said Fine; to the said William Levett, from the 22th Day of December, 1645; to the said Thomas Gumter, from the 9th Day of January, 1645; and to the said Richard Kibe, from the Day of the Payment of his said Fine; with an Exception of the Rights or Estates of the said Henry Goreing, William Levett, Thomas Gunter, and Richard Kibe, in or to all Advowsons, Presentations, and Right of Patronage, to any Church or Chapel; which said Pardons, so prepared, the Commissioners for the Great Seal of England for the Time being are hereby authorized to pass under the said Great Seal accordingly: Provided always, That this Ordinance, or the said Pardons thereon to be passed, shall not extend to free the said Henry Goreing, William Levett, Thomas Gunter, and Rich'd Kibe, or any of them, from any further Compositions, for any other Lands, Goods, or Chattels, than what are contained in the Particulars aforesaid; and that, in case the said Lands mentioned in the said Particulars were of greater Yearly Values than are therein expressed during Three Years before the Year of our Lord 1640, then the said Henry Goreing, William Levett, Thomas Gumter, and Rich'd Kibe, shall pay such further Fine, by Way of Composition, as both Houses of Parliament shall appoint." "Whereas Henry Hackett, of Grimley, in the County of Worcester, Gentleman, hath by both Houses of Parliament been admitted to his Fine of Three Hundred Pounds, for that he adhered unto and assisted the King, against the Parliament: The Lords and Commons assembled in Parliament do hereby authorize and appoint His Majesty's Solicitor General to prepare a Pardon to the said Henry Hackett, for his said Offence, in such Form as is agreed by both Houses for like Offenders, together with a Grant of, and Restitution to him, his Heirs and Assigns, of all his Lands, Goods, and Chattels, and other Estates for which the said Fine was accepted, according to the Particular thereof made, and entered with the Committee at Gouldsmiths Hall, and of all Mean Profits thereof, to the said Henry Hackett, from the One and Twentieth Day of March, 1646, with an Exception of the Right or Estate of the said Henry Hackett in or to all Advowsons, Presentations, and Right of Patronage, to any Church or Chapel; which said Pardon, so prepared, the Commissioners for the Great Seal of England for the Time being are hereby authorized to pass under the Great Seal accordingly: Provided always, That this Ordinance, or the said Pardon thereon to be passed, shall not extend to free the said Henry Hackett from any further Composition, for any other Lands, Goods, or Chattels, than what are contained in the Particular aforesaid; and that, in case the said Lands mentioned in the said Particular were of greater Yearly Values than are therein expressed during Three Years before the Year of our Lord 1640, then the said Henry Hackett shall pay such further Fine, by Way of Composition as both Houses of Parliament shall appoint." "Whereas John Crane, of Loughton, in the County of Bucks, Esquire, hath by both Houses of Parliament been admitted to his Fine of One Thousand and Eighty Pounds, he having deserted his Dwelling, and lived in the Enemy's Quarters: The Lords and Commons assembled in Parliament do hereby authorize and appoint His Majesty's Solicitor General to prepare a Pardon to the said John Crane, for his said Offence, in such Form as is agreed by both Houses for like Offenders, together with a Grant of, and Restitution to him, his Heirs and Assigns, of all his Lands, Goods, and Chattels, and other Estate for which the said Fine was accepted, according to a Particular thereof made, and entered with the Committee at Gouldsmiths Hall, and of all Mean Profits thereof, from the Twenty-sixth Day of January, 1646, with an Exception of the Right or Estate of the said John Crane in or to all Advowsons, Presentations, and Right of Patronage, to any Church or Chapel; which said Pardon, so prepared, the Commissioners for the Great Seal of England for the Time being are hereby likewise authorized to pass under the said Great Seal accordingly: Provided always, That this Ordinance, or the said Pardon thereon to be passed, shall not extend to free the said John Crane from a further Composition, for any other Lands, Goods, or Chattels, than what are contained in the Particular aforesaid; and that, in case the said Lands mentioned in the said Particular were of greater Yearly Value than are therein expressed during Three Years before the Year of our Lord 1640, then the said John Crane shall pay such further Fine, by Way of Composition, as both Houses of Parliament shall appoint." "Whereas Phillip Brace, of Doverdale, in the County of Worcester, Gentleman, hath by both Houses of Parliament been admitted to his Fine of Two Hundred Eighty-nine Pounds, for that he was in Arms against the Parliament: The Lords and Commons assembled in Parliament do hereby authorize and appoint His Majesty's Solicitor General to prepare a Pardon to the said Phillip Brace, for his said Offence, in such Form as is agreed by both Houses for like Offenders, together with a Grant of, and Restitution to him, his Heirs and Assigns, of all his Lands, Goods, and Chattels, and other Estate for which the said Fine was accepted, according to a Particular thereof made, and entered with the Committee at Gouldsmiths Hall, and of all Mean Profits, to the said Phillip Brace, from the Fourteenth Day of August, 1646, with an Exception of the Right or Estate of the said Phillip Brace in or to all Advowsons, Presentations, and Right of Patronage, to any Church or Chapel; which said Pardon, so prepared, the Commissioners for the Great Seal of England for the Time being are hereby authorized to pass under the said Great Seal accordingly: Provided always, That this Ordinance, or the said Pardon thereon to be passed, shall not extend to free the said Phillipp Brace from any further Composition, for any other Lands, Goods, or Chattels, than what are contained in the Particular aforesaid; and that, in case the said Lands mentioned in the said Particular were of greater Yearly Values than are therein expressed during Three Years before the Year of our Lord 1640, then the said Phillip Brace shall pay such further Fine, by Way of Composition, as both Houses of Parliament shall appoint." "Whereas George Greaves of Beely, in the County of Derby, Gentleman, and Richard Greaves, of the same Place, Gentleman, have by both Houses of Parliament been admitted to their Fines; of, videlicet, the said George Greaves to his Fine of Fourscore Pounds; the said Rich'd Greaves to his Fine of Forty-nine Pounds, Ten Shillings, Eight Pence; the said George Greaves having been in Arms against the Parliament, and the said Rich'd Greaves having assisted the Forces raised against the Parliament: The Lords and Commons assembled in Parliament do hereby authorize and appoint His Majesty's Solicitor General to prepare a Pardon to the said George Greaves and Richard Greaves, for their said Offences, in such Form as is agreed by both Houses for like Offenders, together with a Grant of, and Restitution to them, their Heirs and Assigns, of all their Lands, Goods, and Chattels, and other Estates for which the said Fines were accepted, according to Particulars thereof made, and entered with the Committee at Gouldsmiths Hall, and of all Mean Profits thereof; (videlicet,) to the said George Greaves, from the Day of the Payment of the said Fine; to the said Richard Greaves, from the Day of the Payment of his said Fine; with an Exception of the Rights or Estates of the said George Greaves and Richard Greaves in or to all Advowsons, Presentations, and Right of Patronage, to any Church or Chapel; which said Pardons, so prepared, the Commissioners for the Great Seal of England for the Time being are hereby authorized to pass under the said Great Seal accordingly: Provided always, That this Ordinance, or the said Pardons thereon to be passed, shall not extend to free the said George Greaves and Rich'd Greaves from any further Compositions, for any other Lands, Goods, or Chattels, than what are contained in the Particulars aforesaid; and that, in case the said Lands mentioned in the said Particulars were of greater Yearly Values than are therein expressed during Three Years before the Year of our Lord 1640, then the said George Greaves and Richard Greaves shall pay such further Fines, by Way of Composition, as both Houses of Parliament shall appoint." "Whereas Thomas Bromley, of Hampton, in the County of Chester, Esquire, hath by both Houses of Parliament been admitted to his Fine of Three Hundred and Twenty Pounds, for that he adhered unto and assisted the King, against the Parliament: The Lords and Commons assembled in Parliament do hereby authorize and appoint His Majesty's Solicitor General to prepare a Pardon to the said Thomas Bromley, for his said Offence, in such Form as is agreed by both Houses for like Offenders, together with a Grant of, and Restitution to him, his Heirs and Assigns, of all his Lands, Goods, and Chattels, and other Estate for which the said Fine was accepted, according to a Particular thereof made, and entered with the Committee at Gouldsmiths Hall, and of all Mean Profits thereof, to the said Thomas Bromley, from the 19th Day of August, 1646, with an Exception of the Right or Estate of the said Thomas Bromley in or to all Advowsons, Presentations, and Right of Patronage, to any Church or Chapel; which said Pardon, so prepared, the Commissioners for the Great Seal of England for the Time being are hereby authorized to pass under the said Great Seal accordingly: Provided always, That this Ordinance, or the said Pardon thereon to be passed, shall not extend to free the said Thomas Bromley from any further Composition, for any other Lands, Goods, or Chattels, than what are contained in the Particular aforesaid; and that, in case the said Lands mentioned in the said Particular were of greater Yearly Values than are therein expressed during Three Years before the Year of our Lord 1640, then the said Thomas Bromly shall pay such further Fine, by Way of Composition, as both Houses of Parliament shall appoint." "Whereas John Evett, of Woodhall, in the County of Worcester, Gentleman, hath by both Houses of Parliament been admitted to his Fine of Two Hundred and Fifty Pounds, for that he adhered unto and assisted the King, against the Parliament: The Lords and Commons assembled in Parliament do hereby authorize and appoint His Majesty's Solicitor General to prepare a Pardon to the said John Evatt, for his said Offence, in such Form as is agreed by both Houses for like Offenders, together with a Grant of, and Restitution to him, his Heirs and Assigns, of all his Lands, Goods, and Chattels, and other Estate for which the said Fine was accepted, according to a Particular thereof made, and entered with the Committee at Gouldsmiths Hall, and of all Mean Profits thereof, to the said John Evett, from the 14th Day of August, 1646, with an Exception of the Right or Estate of the said John Evett in or to all Advowsons, Presentations, and Right of Patronage, to any Church or Chapel; which said Pardon, so prepared, the Commissioners for the Great Seal of England for the Time being are hereby authorized to pass under the said Great Seal accordingly: Provided always, That this Ordinance, or the said Pardon thereon to be passed, shall not extend to free the said John Evatt from any further Composition, for any other Lands, Goods, or Chattels, than what are contained in the Particular aforesaid; and that, in case the said Lands mentioned in the said Particular were of greater Yearly Values than are therein expressed during Three Years before the Year of our Lord 1640, then the said John Evett shall pay such further Fine, by Way of Composition, as both Houses of Parliament shall appoint." "Whereas Richard Elmhurst, of Houndhill, in the County of Yorke, Yeoman, hath by both Houses of Parliament been admitted to his Fine of Five Hundred Sixty-six Pounds, for that he adhered unto the Forces raised against the Parliament: The Lords and Commons assembled in Parliament do hereby authorize and appoint His Majesty's Solicitor General to prepare a Pardon to the said Rich'd Elmhurst, for his said Offence, in such Form as is agreed by both Houses for like Offenders, together with a Grant of, and Restitution to him, his Heirs and Assigns, of all his Lands, Goods, and Chattels, and other Estate for which the said Fine was accepted, according to a Particular thereof made, and entered with the Commitmittee at Gouldsmiths Hall, and of all Mean Prosits thereof, to the said Richard Elmburst, from the Fourth Day of August, 1645, with an Exception of the Right or Estate of the said Richard Elmehurst in or to all Advowsons, Presentations, and Right of Patronage, to any Church or Chapel; which said Pardon, so prepared, the Commissiones for the Great Seal of England for the Time being are hereby authorized to pass under the said Great Seal accordingly: Provided, That this Ordinance, or the said Pardon thereon to be passed, shall not extend to free the said Richard Elmhurst from any further Composition, for any other Lands, Goods, or Chattels, than what are contained in the Particular aforesaid; and that, in case the said Lands mentioned in the said Particular were of greater Yearly Values than are therein expressed during Three Years before the Year of our Lord 1640, then the said Rich'd Elmburst shall pay such further Fine, by Way of Composition, as both Houses of Parliament shall appoint." "Whereas George Parker, of Weston Coyney, in the County of Stafford, Esquire, hath by both Houses of Parliament been admitted to his Fine of One Hundred and Twenty Pounds, he having lived in the Enemy's Quarters, and adhered to the Forces raised against the Parliament: The Lords and Commons assembled in Parliament do hereby authorize and appoint His Majesty's Solicitor General to prepare a Pardon to the said George Parker, for his said Offence, in such Form as is agreed by both Houses for like Offenders, together with a Grant of, and Restitution to him, his Heirs and Assigns, of all his Lands, Goods, and Chattels, and other Estate for which the said Fine was accepted, according to a Particular thereof made, and entered with the Committee at Gouldsmiths Hall, and of all Mean Profits, from the 17th Day of April, 1646, with an Exception of the Right or Estate of the said George Parker in or to all Advowsons, Presentations, and Right of Patronage, to any Church or Chapel; which said Pardon, so prepared, the Commissioners of the Great Seal of England for the Time being are hereby likewise authorized to pass under the said Great Seal accordingly: Provided always, That this Ordinance, or the said Pardon thereon to be passed, shall not extend to free the said George Parker from a further Composition, for any other Lands, Goods, or Chattels, than what are contained in the Particular aforesaid; and in case the said Lands mentioned in the said Particular were of greater Yearly Value than are therein expressed during Three Years, before the Year of our Lord 1640, then the said George Parker shall pay such further Fine, by Way of Composition, as both Houses of Parliament shall appoint." "Whereas Sir William Thorold, of Marston, in the County of Lincolne, Knight, hath been by both Houses of Parliament admitted to his Fine of Four Thousand One Hundred and Sixty Pounds, he having been a Commissioner of Array, and executed that Commission: The Lords and Commons assembled in Parliament do hereby authorize and appoint His Majesty's Solicitor General to prepare a Pardon to the said Sir William Thorold, for his said Offence, in such Form as is agreed by both Houses for like Offenders, together with a Grant of, and Restitution to him, his Heirs and Assigns, of all his Lands, Goods, and Chattels, and other Estate for which the said Fine was accepted, according to a Particular thereof made, and entered with the Committee at Gouldsmiths Hall, and of all Mean Profits thereof, from the 16th Day of March, 1646, with an Exception of the Right or Estate of the said Sir Will'm Tborold in or to all Advowsons, Presentations, and Right of Patronage, to any Church or Chapel; which said Pardon, so prepared, the Commissioners for the Great Seal of England for the Time being are hereby likewise authorized to pass under the said Great Seal accordingly: Provided always, That this Ordinance, or the said Pardon thereon to be passed, shall not extend to free the said Sir William Thorold from a further Composition, for any other Lands, Goods, or Chattels, than what are contained in the Particular aforesaid; and that, in case the said Lands mentioned in the said Particular were of greater Yearly Value than are therein expressed during Three Years before the Year of our Lord 1640, then the said Sir William Thorold shall pay such further Fine, by Way of Composition, as both Houses of Parliament shall appoint." "Whereas Charles Proger, of Wearndee, in the County of Monmouth, Esquire, hath by both Houses of Parliament been admitted to the Fine of Three Hundred and Thirty Pounds, he having been in Arms against the Parliament: The Lords and Commons assembled in Parliament do hereby authorize and appoint His Majesty's Solicitor General to prepare a Pardon to the said Charles Proger, for his said Offence, in such Form as is agreed by both Houses for like Offenders, together with a Grant of, and Restitution to him, his Heirs and Assigns, of all his Lands, Goods, and Chattels, and other Estate for which the said Fine was accepted, according to a Particular thereof made, and entered with the Committee at Gouldsmiths Hall, and of all Mean Profits thereof, from the Eighth Day of January, 1646, with an Exception of the Right or Estate of the said Charles Proger in or to all Advowsons, Presentations, and Right of Patronage, to any Church or Chapel; which said Pardon, so prepared, the Commissioners of the Great Seal of England for the Time being are hereby likewise authorized to pass under the said Great Seal accordingly: Provided always, That this Ordinance, or the said Pardon thereon to be passed, shall not extend to free the said Charles Proger from a further Composition, for any other Lands, Goods, or Chattels, than what are contained in the Particular aforesaid; and that, in case the said Lands mentioned in the said Particular were of greater Yearly Value than are therein expressed during Three Years before the Year of our Lord 1640, then the said Charles Proger shall pay such further Fine, by Way of Composition, as both Houses of Parliament shall appoint." "Whereas Thomas Leaman, of Aylesham, in the County of Norfolke, Gentleman, hath by both Houses of Parliament been admitted to the Fine of Three Hundred Sixty and Seven Pounds, he having adhered unto and assisted the Forces against the Parliament: The Lords and Commons assembled in Parliament do hereby authorize and appoint His Majesty's Solicitor General to prepare a Pardon to the said Thomas Leaman, for his said Offence, in such Form as is agreed by both Houses for like Offenders, together with a Grant of, and Restitution to him, his Heirs and Assigns, of all his Lands, Goods, and Chattels, and other Estate for which the said Fine was accepted, according to a Particular thereof made, and entered with the Committee at Gouldsmiths Hall, and of all Mean Profits thereof, from the Tenth Day of September, 1646, with an Exception of the Right or Estate of the said Thomas Leaman in or to all Advowsons, Presentations, and Right of Patronage, to any Church or Chapel; which said Pardon, so prepared, the Commissioners for the Great Seal of England for the Time being are hereby likewise authorized to pass under the said Great Seal accordingly: Provided always, That this Ordinance, or the said Pardon thereon to be passed, shall not extend to free the said Thomas Leaman from a further Composition, for any other Lands, Goods, or Chattels, than what are contained in the Particular aforesaid; and that, in case the said Lands were of greater Yearly Value than are therein expressed during Three Years before the Year of our Lord 1640, then the said Thomas Leaman shall pay such further Fine, by Way of Composition, as both Houses of Parliament shall appoint." 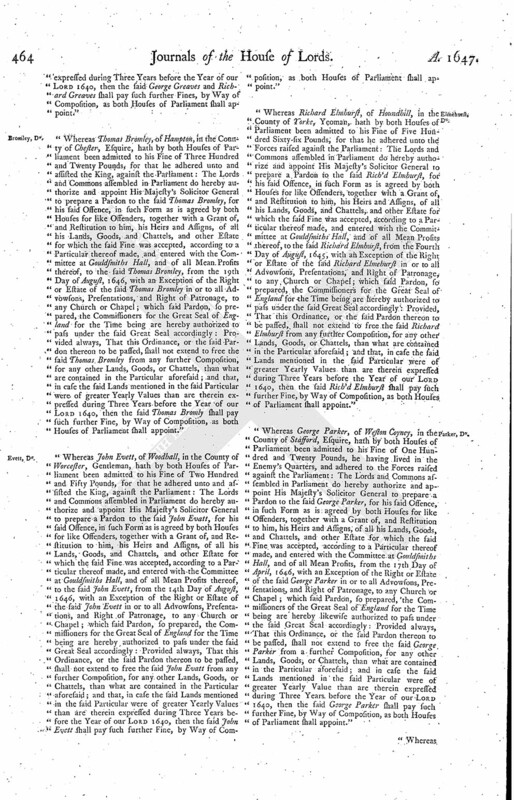 "Whereas Hugh Wilbraham, of Draklow, in the County of Chester, Esquire, hath by both Houses of Parliament been admitted to his Fine of Three Hundred Sixty and Two Pounds, he having adhered to the Forces raised against the Parliament: The Lords and Commons assembled in Parliament do hereby authorize and appoint His Majesty's Solicitor General to prepare a Pardon to the said Hugh Wilbraham, for his said Offence, in such Form as is agreed by both Houses for like Offenders, together with a Grant of, and Restitution to him, his Heirs and Assigns, of all his Lands, Goods, and Chattels, and other Estate for which the said Fine was accepted, according to a Particular thereof made, and entered with the Committee at Gouldsmiths Hall, and of all Mean Profits thereof, from the 10th Day of December, 1646, with an Exception of the Right or Estate of the said Hugh Wilbraham in or to all Advowsons, Presentations, and Right of Patronage, to any Church or Chapel; which said Pardon, so prepared, the Commissioners of the Great Seal of England for the Time being are hereby likewise authorized to pass under the said Great Seal accordingly: Provided always, That this Ordinance, or the said Pardon thereon to be passed, shall not extend to free the said Hugh Wilbraham from a further Composition, for any other Lands, Goods, or Chattels, than what are contained in the Particular aforesaid; and that, in case the said Lands mentioned in the said Particular were of greater Yearly Value than are therein expressed during Three Years before the Year of our Lord 1640, then the said Hugh Wilbraham shall pay such further Fine, by Way of Composition, as both Houses of Parliament shall appoint." Whereas Martha Janes, of Boulton, in the County of Yorke, Spinster, hath by both Houses of Parliament been admitted to the Fine of Five Hundred and Thirty Pounds, she having adhered unto and assisted the Forces raised against the Parliament: The Lords and Commons do hereby authorize and appoint His Majesty's Solicitor General to prepare a Pardon to the said Martha Janes, for her said Offence, in such Form as is agreed by both Houses for like Offenders, together with a Grant of, and Restitution to her, her Heirs and Assigns, of all her Lands, Goods, and Chattels, and other Estate for which the said Fine was accepted, according to a Particular thereof made, and entered with the Committee at Gouldsmiths Hall, and of all Mean Profits thereof, from the 20th Day of April, 1646, with an Exception of the Right or Estate of the said Martha Janes in or to all Advowsons, Presentations, and Right of Patronage, to any Church or Chapel; which said Pardon, so prepared, the Commissioners of the Great Seal of England for the Time being are hereby likewise authorized to pass under the said Great Seal accordingly: Provided always, That this Ordinance, or the said Pardon thereon to be passed, shall not extend to free the said Martha Janes from a further Composition, for any other Lands, Goods, or Chattels, than what are contained in the Particular aforesaid; and that, in case the said Lands mentioned in the said Particular were of greater Yearly Value than are therein expressed during Three Years before the Year of our Lord 1640, then the said Martha Janes shall pay such further Fine, by Way of Composition, as both Houses of Parliament shall appoint." "Whereas Thomas Metcalfe, of Bellarby, in the County of Yorke, Esquire, hath by both Houses of Parliament been admitted to his Fine of Two Hundred Sixty-six Pounds, Thirteen Shillings, and Four Pence, he having been in Arms against the Parliament: The Lords and Commons assembled in Parliament do hereby authorize and appoint His Majesty's Solicitor General to prepare a Pardon to the said Thomas Metcalfe, for his said Offence, in such Form as is agreed by both Houses for like Offenders, together with a Grant of, and Restitution to him, his Heirs and Assigns, of all his Lands, Goods, and Chattels, and other Estate for which the said Fine was accepted, according to a Particular thereof made, and entered with the Committee at Gouldsmiths Hall, and of all Mean Profits thereof, from the 11th Day of February, 1646, with an Exception of the Right or Estate of the said Thomas Metcalffe in or to all Advowsons, Presentations, and Right of Patronage, to any Church or Chapel; which said Pardon, so prepared, the Commissioners of the Great Seal of England for the Time being are hereby likewise authorized to pass under the said Great Seal accordingly: Provided always, That this Ordinance, or the said Pardon thereon to be passed, shall not extend to free the said Thomas Metcalfe from a further Composition, for any other Lands, Goods, or Chattels, than what are contained in the Particular aforesaid; and that, in case the said Lands mentioned in the said Particular were of greater Yearly Value than are therein expressed during Three Years before the Year of our Lord 1640, then the said Thomas Metcalfe shall pay such further Fine, by Way of Composition, as both Houses of Parliament shall appoint." "Whereas Leonard Bowman, of the City of Oxford, Mercer, hath by both Houses of Parliament been admitted to the Fine of Two Hundred and Sixteen Pounds, he having been in Arms against the Parliament: The Lords and Commons assembled in Parliament do hereby authorize and appoint His Majesty's Solicitor General to prepare a Pardon to the said Leonard Bowman, for his said Offence, in such Form as is agreed by both Houses for like Offenders, together with a Grant of, and Restitution to him, his Heirs and Assigns, of all his Lands, Goods, and Chattels, and other Estate for which the said Fine was accepted, according to a Particular thereof made, and entered with the Committee at Gouldsmiths Hall, and of all Mean Profits thereof, from the 18th Day of January, 1646, with an Exception of the Right or Estate of the said Leonard Bowman in or to all Advowsons, Presentations, and Right of Patronage, to any Church or Chapel; which said Pardon, so prepared, the Commissioners of the Great Seal of England for the Time being are hereby likewise authorized to pass under the said Great Seal accordingly: Provided always, That this Ordinance, or the said Pardon thereon to be passed, shall not extend to free the said Leonard Bowman from a further Composition, for any other Lands, Goods, or Chattels, than what are contained in the Particular aforesaid; and that, in case the said Lands mentioned in the said Particular were of greater Yearly Value than are therein expressed during Three Years before the Year of our Lord 1640, then the said Leonard Bowman shall pay such further Fine, by Way of Composition, as both Houses of Parliament shall appoint." Die Martis, 24 Augusti, 1647. By the Committee of Lords and Commons for the Admiralty and Cinque Ports. "Whereas Captain Bowen, Commander of The Hart Frigatt, hath lately taken at Sea an Irish Frigate, having aboard her, at her Taking, about Forty Irish, who are Prisoners at Portsm°. 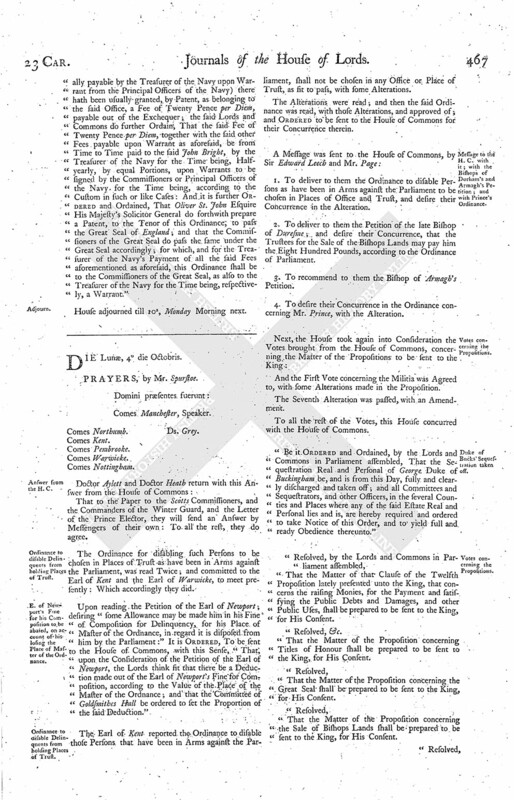 ; and whereas Captain Beddall, Captain of The Adventure Frigat, hath also taken an Irish Frigate on the West of England, having aboard her, at her Taking, near Forty Irish, who are Prisoners at Plymouth; and forasmuch as this Committee is informed, That they draw a great Charge upon the State, in the several Places wherein they are imprisoned, for their Maintenance: Ordered, That Report be made of this Matter to both Houses of Parliament, with a Desire that they will please to declare how the said Prisoners shall be disposed of. Ordered, &c. That Doctor Aylett shall give Institution unto John Gerrard Clerk, to the Rectory of East Aldrington, in the County of Sussex, void by the Death of the late Incumbent; salvo Jure cujuscunque; presented under the Hand and Seal of Abraham Edwards Gentleman, the lawful Patron pleno Jure. Ordered, That Doctor Aylett shall give Institution unto John Crow Master of Arts, to the Vicarage of Aswell, in the County of Hertford, void by the Death of the late Incumbent, salvo Jure cujuscunque; Presentation under Great Seal. Ordered, That Doctor Heath give Institution and Induction unto George Osborne Clerk, Master of Arts, to the Rectory of Middleton, in the County of Yorke, void by the Death of the last Incumbent; granted by the Great Seal. "Whereas Henry Goddard, who, by virtue of Letters Patents under the Great Seal of England, did hold and exercise the Office of Shipwright and Master-builder of all Ships and Vessels for the Service of His Majesty at Chatham, is lately deceased; by Means whereof the said Place is become vacant: The Lords and Commons in Parliament assembled do hereby ordain, constitute, and appoint, John Bright to be Master Shipwright at Chatham, and to hold, exercise, and enjoy the said Office, together with all and every the Fees, Profits, and Commodities whatsoever, to the same of Right belonging, in as large and ample Manner, to all Intents and Purposes, as the same was heretofore held and enjoyed by the said Henry Goddard, and such others as formerly executed the same And whereas (besides the Yearly Fee usually payable by the Treasurer of the Navy upon Warrant from the Principal Officers of the Navy) there hath been usually granted, by Patent, as belonging to the said Office, a Fee of Twenty Pence per Diem, payable out of the Exchequer; the said Lords and Commons do further Ordain, That the said Fee of Twenty Pence per Diem, together with the said other Fees payable upon Warrant as aforesaid, be from Time to Time paid to the said John Bright, by the Treasurer of the Navy for the Time being, Halfyearly, by equal Portions, upon Warrants to be signed by the Commissioners or Principal Officers of the Navy for the Time being, according to the Custom in such or like Cases: And it is further Ordered and Ordained, That Oliver St. John Esquire His Majesty's Solicitor General do forthwith prepare a Patent, to the Tenor of this Ordinance, to pass the Great Seal of England; and that the Commissioners of the Great Seal do pass the same under the Great Seal accordingly; for which, and for the Treasurer of the Navy's Payment of all the said Fees aforementioned as aforesaid, this Ordinance shall be to the Commissioners of the Great Seal, as also to the Treasurer of the Navy for the Time being, respectively, a Warrant." House adjourned till 10a, Monday Morning next.